A near-continuous, 43-mile linear park along Boston’s shoreline, the Harborwalk connects Boston’s waterfront neighborhoods to Boston Harbor and each other. Nearing completion, it stretches from the Neponset River in lower Dorchester to Constitution Beach in East Boston via Charlestown, the North End, Downtown, Seaport, South Boston and Dorchester. For over three decades, Boston Harbor Now has worked closely with the City of Boston, Massachusetts state agencies, private developers and waterfront residents to establish the Boston Harborwalk along 43 of the 47 miles of Boston’s shoreline (Logan Airport was excluded after September 11, 2001). The Massachusetts Department of Environmental Protection (MassDEP) will direct mitigation funds from the Fan Pier development to the creation of the Boston Harbor Now Harborwalk Benefits Map and public waterfront amenities database. 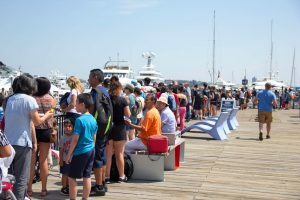 The user-friendly map and database will create a one-stop-shop option for visitors to easily navigate the waterfront and understand the full inventory of public amenities offered along the Harborwalk. The funding comes from The Fallon Company – whose 21-acre Fan Pier development constructed in the Seaport District in 2007 includes multiple waterfront parks and is surrounded by the Harborwalk on three sides – as part of their Chapter 91 license agreement with MassDEP. 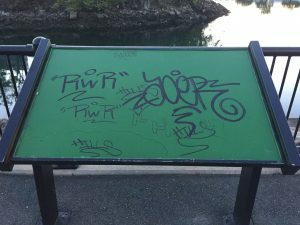 Need to report a maintenance issue along the HarborWalk? Take a picture of the problem, note the nearest street address and/or building, and contact Boston 311. Want to do more? 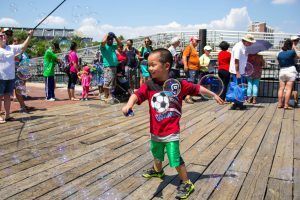 Join the Friends of the Harborwalk! Thanks! Boston Harbor Now works closely with the Boston Planning & Development Agency, private developers, residents and other waterfront advocates and public agencies to complete, maintain and improve the Harborwalk.